Having hugely overslept, we went to another park. So, we went to explore the park across the road. 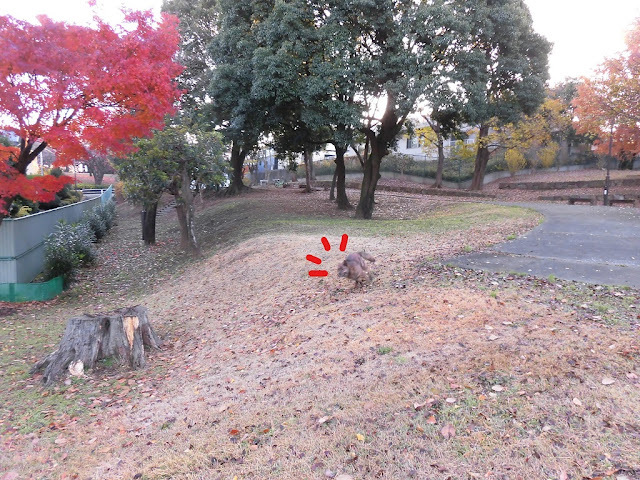 A small hill is converted into a park. Flat land at the top of the hill. On our way home, spotted a familiar face down below. A Havanese, Nike, will be coming up to meet us. As we waited for Nike, 'Cava' (4-yrs old male Cavelier) comes along. Nike (3-years old Havanese) also arrives. Cava takes an instant liking to Nike. The sun is getting higher. we met more familiar faces. Kotarou (Lab-mix) releaving himself by the side of the park. Taiga and Kotarou are good friends.